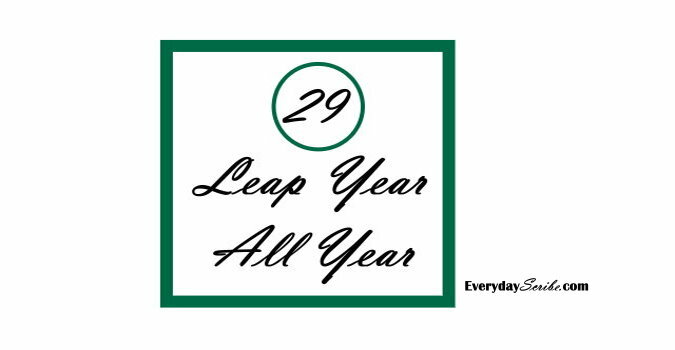 The elusive 29th of February that only makes an appearance every four years made its way onto the calendar, as you may have noticed. I asked my faithful newsletter subscribers what they planned to do on this extra day, but after I sent the newsletter, another thought struck me. We have 366 days this year, not just 365. If not for February 29, we would be one day closer to the end of the year right now. Yeah. I deserve that, but have you really thought about what that means? We have an entire extra day that isn’t just limited to February. It means we are our current age for another day. We get to be with family another day. Because we have an extra day this year, we have extra time to consider what matters to us and live it. Most people give this idea little more than a passing thought, which is completely understandable. I don’t believe I have ever contemplated it this much before. I just lived my life, doing the same thing as the day before. It didn’t seem to matter that an extra day was given to me every four years. OK, I understand the day isn’t just given to me. There are astronomical reasons behind the extra day. The point is that now that I am trying to live my life differently, live my life with purpose and intention, I am able to start seeing the potential significance of an extra day. Perhaps you already saw its possibilities. If so, good for you! Whether you are just pondering this idea or have thought about it for years, it is an interesting notion. One that I hope to reflect on for the entire year. February 29, 2016. Just an extra Monday? Just an extra day in February? Or a 366th day? One more day in the whole year to be more you!